To many people, the phenomenon known scientifically as the circadian rhythm is bleeding obvious. We sleep in the night and are awake during the day, long-haul flights like those from the UK to Australia gives you jetlag, and night shifts are a right pain in the bum. Detailed explanations involving transcription-translation feedback loops and phase response curves don’t change those facts, they’re a fact of life when we live on a rotating world. But many scientists, myself included, are fascinated in the details, and some scientists, like Céline Vetter and colleagues at the Institute of Medical Psychology at Ludwig-Maximilian-University in Munich, use this eye for detail to find out how we might best cope with our biological timing in a 24-hour society. 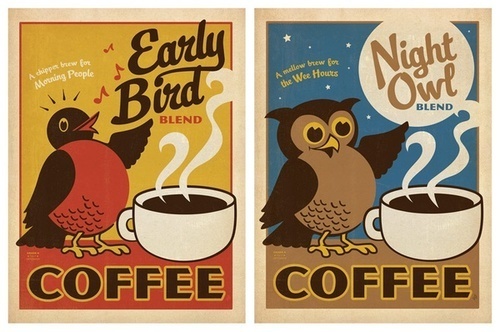 Coffee: Are you an early bird or a night owl?